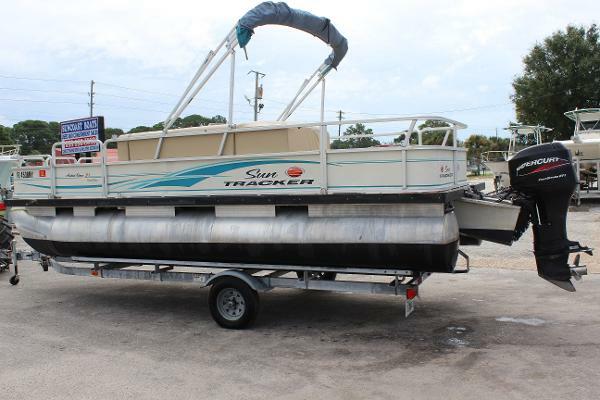 2009 Sun Tracker 21 Fishin Barge This boat is very solid and after you add a motor , can be used as is. It could use a little upholstery work if you wanted to make it perfect, but would make a nice inexpensive vessel just like it is. Came off fresh water lake, and the owner kept the motor and trailer for his new pontoon. We do have some used motors and trailers available. 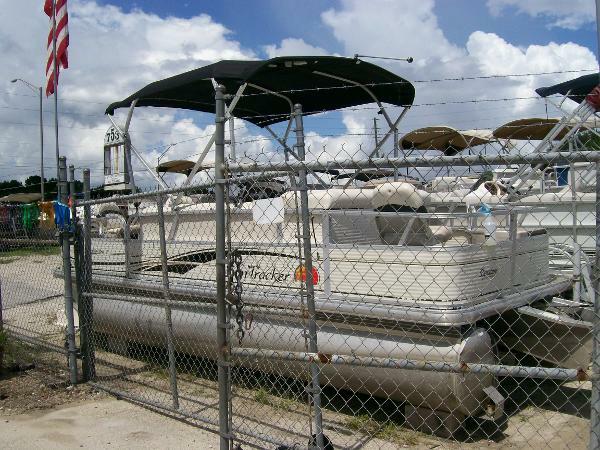 Or , buy this boat and you can leave it here while you shop around for your own preference and price range. 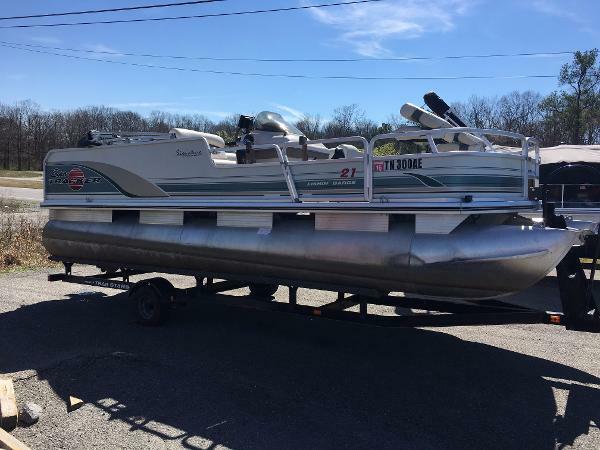 2010 Sun Tracker 21' Fishin' Barge Sun Tracker Signature Series 21’ Fishin' Barge (21’11” X 8’1”), ’08 Mercury 60HP Bigfoot 4 stroke EFI, ’09 Trailstar tandem wide axle bunk trailer w/ brakes, load guides & ladder winch stand. This boat is White w/ Black accents. The floorplan has a drivers bucket seat w/ port L-Lounge, 2 fishing seat in the Bow and (1) in the port rear. Helm features include tach, volt, fuel & water pressure gauges, 12V rec., Jensen CD stereo w/ AUX input & a Lowrance X51 Pro Fishfinder. Fishing features include (2) aerated Livewells, rod holders, hidden rod storage & a removable Motorguide 12V 55lb thrust bow mount, wireless foot control trolling motor. Other features include a pop up privacy enclosure, pedestal table, interior light, Trash recepticle, under dash cooler storage, swim ladder, Bimini shade top & full snap down playpen cover for storage. 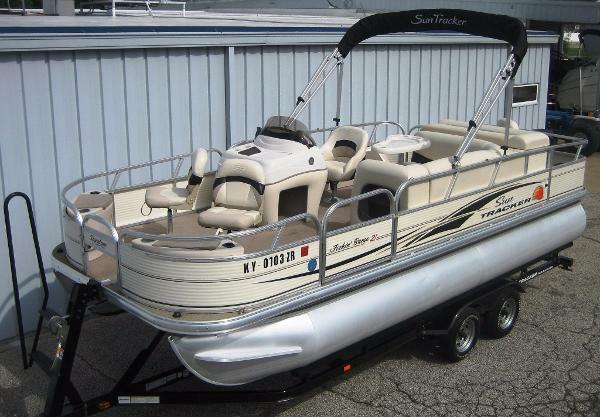 This boat is in very nice condition with only 103.6 engine hours use. 2006 Sun Tracker 21 Fishin Barge 2006 Sun Tracker Fishing Barge (Coastal Series Aluminum Pontoon) powered by a 2003 Mercury 60HP Four Stroke Bigfoot with SS prop (exact hours unknown, meter quit working around 260 hrs). Boat has new upholstery on bench seats and brand new bottom paint. Old deck carpet has been removed and deck sealed with Awl Grip marine paint. Boat needs bow seats. Included in sale is a 2009 Amera-Trail single torsion axel trailer with bow ladder. NADA Low Retail is $10,900...will sell "as is" for $8,500 OBO, no "reasonable" offer refused. Boat can be seen at Suncoast Boats, 620 Thomas Dr., PCB, FL. 32408.